CHN Production has spent years capturing the works of Michael & Richard Nguyen to share their combined 22 years of dedication in martial arts. Their 8-DVD training series is filed with the United States Library of Congress. 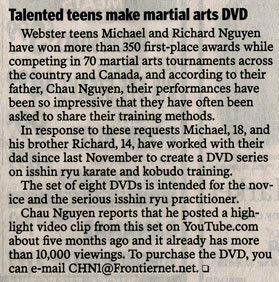 CHNproduction.com is very pleased to sponsor The Complete Works of Isshin Ryu Karate & Kobudo DVD Series by two talented martial artists and authors, Michael & Richard Nguyen. Hope you join us to support their long and exciting video project. "That was an excellent substance of kata and kumite." ~ Grandmaster Ed McGrath (New Jersey), Isshinryu , "The Art"
The DVD series is filmed and produced with the highest standards and professional equipments. All Isshin Ryu katas include front & side views, full power & slow motion, explanation, and bunkai. Web Design by CHN Production - Copyright © 2007 - 2017, All rights reserved.